Jason Moreta scored four goals to help No. 7 Tesoro defeat No. 10 Murrieta Mesa 10-6 on Tuesday. The Titans will face Foothill in Round 2 on Thursday. The Titans started to build some momentum after Moreta opened the scoring with an unassisted dodge through heavy Mesa defense, and Carson Spooner (2g, 1a ) finished a beautiful feed from Jonathan Gibson (1g,1a) to put the Titans up 2-0. Mesa, playing in the program’s first post-season game, showed that they came to play when Cameron Bentley, assisted by Derek D’Aquino, made the most of an extra man opportunity. Moreta responded with a textbook bounce shot to return the gap to two, but Jacob Ray wasted no time in making it a one-goal game again. Ray led a one-man fast-break from the faceoff to find the back of the Tesoro net and put the Rams back within one. And after some great goal keeping on both ends, the quarter ended with the Titans up 3-2. Ryan Harrington (1g) scored the first of three Tesoro unanswered goals in the second quarter. Tesoro goalie Hunter Souza and his relentless defense kept the Rams scoreless for the rest of the half while Moreta (unassisted) and Spooner off a feed from Luke Molinari (1a) stretched the Tesoro lead to 6-2 by halftime. 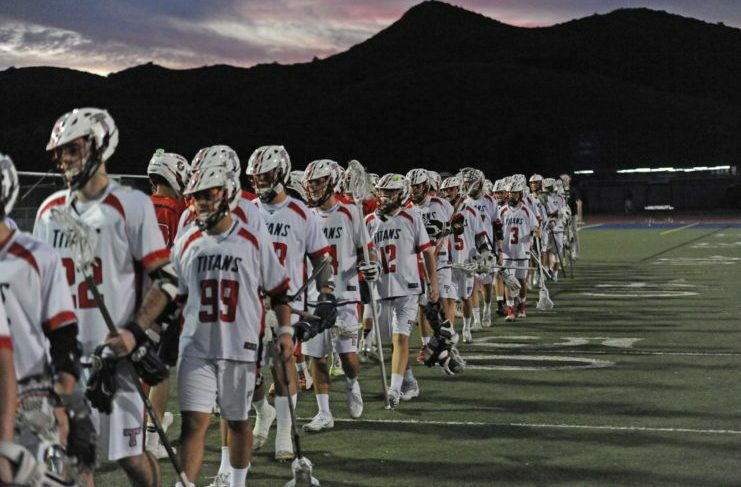 With goalie Justus Romo making life difficult on the Tesoro shooters, the Rams held the Titans to a lone Chris Graffia (1g) goal in the third quarter. Unassisted goals by Preston Jaurequi and Josh Crisler pulled the Rams to within 7-4 with 12 minutes to play. Tesoro got their groove back in the fourth quarter while the Rams continued to battle hard and keep the pressure on. Gibson started Tesoro off with an unassisted goal, and Moreta got his fourth for the night with a quick stick on the crease off a feed from Spooner at X. Bentley added his second for the night off a feed from Nick Rizzo and Gibson responded with his second unassisted goal of the night. The Rams never surrendered and with less than a minute left in the game and man down, Jaurequi fought through two defenders to add one more to the board and his second for the night to end the game 10 – 6 Tesoro. Tesoro will play No. 2 Foothill on Thursday. The Rams look forward to carrying the momentum that was built up by the most successful season in program history into next year.